Oh man. I love a good story about an outbreak of some kind of killer illness. The Andromeda Strain? Read it and seen every Sci-Fi original movie based on it. So when I saw a YA outbreak novel available on Netgalley I had to read it. 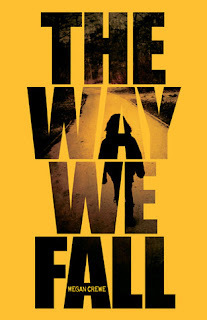 The Way We Fall is about how a teen girl, Kaelyn, deals with the outbreak of a deadly virus on the small island where she lives with her family. Average. As I'd expect from an outbreak-themed novel, the plot takes precedence over the writing. There's nothing much to comment on, good or bad, in terms of the writing itself because the main focus of the novel isn't characterization or setting, but plot alone. Off the charts. I loved it! I certainly couldn't put it down - the plot was intriguing and compelling. I read it in just a few hours and was thoroughly entertained. The characters are interesting, but it's really the outbreak part of the story that appealed to me. I loved hearing how it started, how the government responded to the initial reports from the island, the eventual quarantine, and the fight for survival as resources run low. Even if they weren't 100% believable, I still found the characters likable and was rooting for their survival. I recommend it to all YA readers and to those who are interested in outbreak-style novels. I'd also recommend it to those who have been enjoying the current wave of dystopian fiction and are interested in a different sort of post-apocalyptic world.